This week on Marketing Marvels, I want to introduce you to Cision, a fantastic communications platform I use here at Convince & Convert. One of the things I love about Cision — and one of the reasons I’m a Cision customer myself — is that it is the best of multiple worlds. It has media monitoring, influencer identification, a contact mechanism, social listening, plus more. It’s kind of like the Swiss Army knife of technology for anybody who’s in communications or public relations. Here to walk us through how it all works is Andrea Rosi, Director of Product Marketing at Cision Communications Cloud. Andrea kept it high level — there are too many awesome features to fit in one episode of Marketing Marvels. Enjoy! Jay Baer: Hey everybody, it is Jay Baer from Convince & Convert, and welcome to another episode of Marketing Marvels, the technology demo show where I show you amazing marketing technology that I personally use and endorse right here are Convince & Convert. Each episode of Marketing Marvels gives you a quick demo of a cutting edge marketing solution that you need to know about. 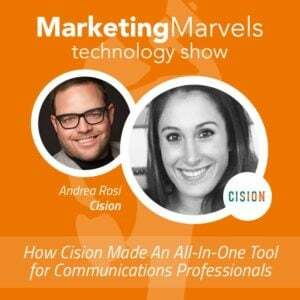 And speaking of somebody and something that you need to know about, today's very special guest on the Marketing Marvels show is Andrea Rosi who is the Director of Product Marketing at the Cision Communications Cloud. Welcome to Marketing Marvels, my friend. Andrea Rosi: Thanks for having me. Jay Baer: So one of the things I really like about Cision and one of the reasons that I've been a Cision customer myself for a long time is it's kind of the best of multiple worlds, right? So you've got media monitoring, you've got influencer identification and contact mechanism, you've got social listening and a bunch of other things. It really is a very multi-faceted set of tools which is why it's a communications cloud. It's kind of like the Swiss army knife of technology for anybody who's in communications, public, relations, or a modern communications professional, whereas before or instead of Cision Communications Cloud you'd have to buy a whole bunch of stuff and try and bolt it together yourself. Cision has it all bolted together for you so you login once and like here's all your stuff. Does that sound accurate, is that a way to describe it? Andrea Rosi: Yeah, absolutely. You're actually stealing the words out of my mouth..
Jay Baer: Hey perfect, I should do this for a living, that's great. So what do you feel like is the ideal customer for Cision Communications Cloud? Now obviously it's a global company, you've got customers in Europe, in Canada, and here in the United States, all over, and as I mentioned a lot of different facets to the product. But we think, "All right, this is the ideal use case." How do you think of that? Andrea Rosi: Honestly, I think any PR and comms professional that has multiple tools that they're managing and has multiple logins, tedious workflow, and are really trying to consolidate all of those processes into one. I think there is not a specific industry or a specific type of company that would benefit over another, I think this could work for really any PR and comms professional. Jay Baer: Both in-house and agency, yeah? Jay Baer: So folks, if you're still using a spreadsheet for a large part of your day-to-day work, and we know that that's true for contact lists and influencer lists and all that, man, do yourself a favor and take a look at the Cision Comms Cloud. But we're going to give you a little glimpse of it today, right? Andrea Rosi: Oh yeah, absolutely. I can actually share my screen right now. Jay Baer: Yeah, let's do it, let's do a screen share. We're going to look at the quick demo. And obviously, as I mentioned, even more so than other episodes we've had here of Marketing Marvels, because of the way the Cision Comms Cloud works there's a lot of pieces and parts to it so trust me when I tell you we're not going to get to see all of it here but we're going to hit the highlight. And so what people should people do, Andrea, is get a full demo if they're interested after the show, yeah? Andrea Rosi: Oh, absolutely. Yeah, I will try to fit in as much as I can in a short time, but I will keep this fairly high level. Jay Baer: Cool, let's do it. Andrea Rosi: All right. So at Cision, again as Jay just mentioned, we're trying to offer one integrated platform to target influencers, to distribute campaigns, and to ultimately measure the success of our media efforts and align those efforts with real business outcomes. So to start, we can click over here on the Influencers tab. And here is where we can actually just start to search for any influencer or journalist. And so you can see over here there's a bunch of criteria you can use in a search. My personal favorite is the Talking About search. So Talking About will pull up the last 60 days of coverage from both traditional journalists or social influencers around this specific topic. Jay Baer: Yeah, there's going to be a lot of people talking about baseball. Andrea Rosi: Yeah, of course there is. So we have 949. Over here on the left hand side we can filter by really any number of things from job roles to outlet types. Maybe if you're more B2B focused versus B2C you'll click on specific outlets there. But I will focus on Chelsea Janes. So Chelsea Janes, we can see a little bit of information about her: her contact information, her Cision pitching profile in this right hand panel, we can see any Twitter posts that she's had recently related to the topic of baseball, and then, at the bottom, we could track any notes that we have kept on Chelsea. But if we scroll up, we can actually just jump right into her profile. In here, again on the left hand side, we have her contact information, we have her pitching profile once again. But here we can actually see any coverage that she has put out there recently related to the searches that we monitor for. Jay Baer: Is that coverage about baseball or coverage in general? Andrea Rosi: This is actually based on the new searches that we have set up, so coverage that we're bringing into our system. Andrea Rosi: Over here we can see some Twitter posts and these are actually more generic, they're not just related to baseball. So these are in general what is Chelsea Janes tweeting. Jay Baer: Sort of chronologically what she tweets. Andrea Rosi: Yeah, exactly. And then over here ... One thing that we talk a lot about at Cision is not just targeting influencers or journalists that we think are most relevant, but really basing that off of the target audiences that we're going after. So we really flipped that model and we're focusing first on audiences and then we're focusing on influencers that will overlap with those end audiences. So here in the Audience tab we can actually see the geography of Chelsea's audiences. We can see not only what she's talking about but we can see the demographics that make up her audience, we can see some of the brands that her audience follows on Twitter, and we can also see some of the topics that they're most interested in on Twitter. So if we feel like yes, this is a good fit, these are the types of audiences we're going after, we might decide to leverage this "You might also like" section down here. This is a machine learning automated process that recommends influencers that have similar profiles to Chelsea Janes. So we can decide maybe we want to click on Dan Steinberg, maybe he'll be relevant and we'll want to add him to the same list that we're adding Chelsea to. So one other thing I want to show you quick. We can also jump straight into the outlet. It's built very similarly to the contact profile so I won't spend too much time here. But we do get to see any affiliated media down here if we click this tab, and we can also see the contacts that work for the Washington Post right here. So it's great to know who actually works there and what they do at the Washington Post in case we'd like to target them as well. One thing that we did ... Oh, go ahead. Jay Baer: For the influencers side, is there an option to look at what people are doing on other platforms other than Twitter to say, "All right, is this person active on Instagram?" Or something along those lines? Andrea Rosi: So right now we are focused mostly on Twitter. I was actually just going to jump and show you our new social edition of the tool - which is a good segue - our ability to search social influencers. And right now this is based on Twitter, we are adding YouTube and Reddit shortly, and then we'll build out from there. So here we might want to just do a general search on sports and we will hit search, and this will pull up any popular influencers related to sports that are not necessarily tied to a specific media outlet. So here we can Zachary Levine. Jay Baer: Who, according to his profile, used to work for the Houston Chronicle, right? It's an interesting example, here's somebody who formally would have been maybe on the other side of the database and if you searched for Zachary he might have shown up on a baseball search before, but now because he's independent he's now on the social influencer side. Does that make sense? >Andrea Rosi: Yeah, absolutely. And you can see, just looking at him, while he might not be tied to that outlet anymore, he still has almost 10,000 followers and he could be extremely influential towards the target audience we're going for. So here we can see some of his recent tweets, we can see the types of content and the target audiences he's going after, and we can choose to target Zachary Levine as well if he fits in with our overall campaign. So jumping over here to Campaigns, this is where we would manage our cross-channel outreach. So we can see here the option, for example maybe we want to schedule a social post tomorrow morning and we want to do that on Twitter, Facebook, LinkedIn, and Pinterest, and this is something that we want to set a time for and it will go out tomorrow. Next, maybe we we'll want to align an email distribution with that so we'll set up our email distribution to go out at that same time. What's great here too is you can actually manage. If you're a manager you can see how people on your team are crafting emails, what activities they're logging. We can get actually a really great picture of this from a single screen in our activities calendar. And then we can even, if we wanted too - I'll wait for this to catch up - we can filter by any of these activities. And I could even jump in and I could see how a specific email campaign is performing. So for example if I jump in here I can see its open rates, its click through rates, the links that were included in that email and how many clicks they have gotten. I could even look at the individuals that have opened an email and what links they have clicked on specifically. And if I so choose, maybe anyone that opened this Under Armour link I could add them to a new list and have some sort of follow-up messaging for those people specifically. Andrea Rosi: One thing that we did add to the Comms Cloud platform is this Distribute tab, and this is our distribution services via PR Newswire. So it's fully integrated into our Comms Cloud platform. So that's another option for outreach as well. Jay Baer: So for example you want to reach Tabitha at the Business Journal there. So you could, in theory, look her up in the database, send her an email and say, "Hey, we've got this new Under Armour shoe thing," and/or you could create a traditional press release, put it out there on PR Newswire and then presumably Tabitha would see it there? Jay Baer: And your recommendation would be to do both of those in most cases, I presume. Andrea Rosi: Oh of course, yeah. And I think the more data you have the more tailored your messaging will be. So I think having insight into even the links that they might have been interested in opening helps with more granular messaging. And then, of course, you do have your option for a traditional press release as well. Andrea Rosi: So from here we'll jump into My Coverage and, again, stop me if there is any areas that you want me to cover in more detail. So here is where we are able to aggregate all of the coverage related to keyword searches that you have set up. And we do have a professional services team that will set those up for you or those people that are users of Boolean logic can do this on their own as well. But here we'll have over 400,000 websites, we have millions of blogs and forums and review sites, we have through our partnership with LexisNexis over 17,000 pieces of print content, and then through our partnership with Critical Mention we also are bringing in broadcast TV coverage as well. Recently we made an acquisition of ShareIQ and when that is embedded into our platform shortly we'll also be monitoring for images as well. So that will all happen in this one place. And while that's great, the real value comes from being able to take action on all of this coverage that you're collecting and through our ability to really tag and use custom fields we're able to make sure that our users and comms professionals can do so. So for example maybe they want to click on this specific search here - we have our searches listed over here - for important news articles, and we could jump into any article really. We can see exactly why it was brought in. So for example Under Armour and Adidas were mentioned, we can see what the sentiment was around that mention and we can see the prominence, how many times Under Armour was mentioned in the article and the projected impact of that. We can see product mentions, message mentions. We can even tie this in with Google Analytics to see what happened after a person saw this coverage, did they end up going to the website, what were the real business outcomes that were generated through this article. And then how did it perform across social channels, did it spark engagement, did the message truly resonate, how many likes, comments, shares. We can gain insight there as well. Jay Baer: So the social data that you're showing there is the actual social performance of that particular piece of content when it was posted to social media by the publication who authored it, in this case I think it's The Ringer. Jay Baer: Great, that's really interesting. So you can see not only does it drop traffic, does it drop awareness, does it drop clicks, but also is it creating comments. Can you click on that social engagement data and then go to the actual social media post? Andrea Rosi: What we can do is we can actually ... That is a good question, sorry Jay. Jay Baer: That's okay, I just didn't know. It looks like it highlights when you light it up. I guess it's not clickable. Andrea Rosi: Yeah, it looks like it's not clickable. Andrea Rosi: Afterwards I can show you in the analysis section we can go through social performance dashboards specifically, but I don't think you can actually link from here. Jay Baer: Okay, just curious. Andrea Rosi: One other thing I would mention is that this edition is actually somewhat new. And while we don't want to be confused with a social media management platform, one thing we are focused in is providing comms professionals with a tool that works for them and really capitalizes on social for PR and comms specifically - so things like that social influencer module that I showed you, easy social engagement stats, and so on and so forth. Jay Baer: Location. Yeah, it's cool. How do you create a coverage report, Andrea? So like, "All right, I got to show my boss all the stuff that people said about us this week." How does that get rolled up? Andrea Rosi: So there's a couple of options. First, maybe there's a few pieces of coverage that you think are fantastic, you can download this as a clipbook or you could actually choose to share it as a news forward. You can click any of these templates, hit next, and then you can choose the recipients, who it's coming from, leave a little message there. Other options, you could set up just standard alerts as well. That will go out maybe every Monday. So we could go and we could look at this Nike Reebok Basketball. So this could be something that we decide we want to share with a certain group of people on a more regular basis, so we can go through here and we can actually select, okay, maybe Monday, Wednesday, Friday we're going to send this out at 12 PM, and we can go from there as well. Jay Baer: And so there'll be sort of links to all the stuff that's happened? Andrea Rosi: Yep. So that would be related to the specific search that we decided to forward, so any news that comes in for that search. Jay Baer: I love the flexibility of that because different companies have different cultures about how they want to be notified. That's great. So actually let's jump into the analysis portion because there is some great reporting here as well. But we could click ... I like the standard analytics. This gives you your traditional metrics and graphs here. So you might see total mentions, reach, you could dive in further and see what caused this spike and click there and see the specific coverage that generated. You can see media by type, the sentiment that was aligned with it, share of voice, mindshare over time. But we might decide that this is something we also want to share with leadership. So we could go up here and we can actually share this as a dynamic link. So I could say, "Let's generate this link, I will share it with specific stakeholders," and then I can jump in over here ... Let me know if you can't see this tab. Jay Baer: Yeah, it's good. Andrea Rosi: Okay. So as long as they have the password they'll go in and they'll see this specific report, and it'll actually automatically update over time. so that's one thing that's an option. Jay Baer: Nice, that's great. Andrea Rosi: Another option here ... Let me go back to our analytics. We could also just download this as a PDF or a doc and we can share it that way as well. So there's a few different options. And you can choose to include specific charts or leave out specific charts if they're not really relevant. Jay Baer: When you do the initial setup and you're going to figure out who you're going to track against on share of voice for example and what keywords you're going to use, what does that process look like and what do I need to do as a new customer to kind of get the ball rolling? Andrea Rosi: So that is something that most of our customers choose to leverage the third party groups. So they'll use the Cision's professional service as consultants and they'll meet and they'll discuss exactly the type of coverage they want to be seeing and our PSC team will actually go in and set up those search strings specifically for the customer. They can edit them over time if they decide they want to make changes or they can create numerous, really unlimited searches as long as they fit the needs of the customer. So it's just a matter of having a conversation about what goals they have in terms of the coverage that they want to see and we can go ahead and make that happen. Andrea Rosi: Yeah. And then other options ... So this is for standard analytics. We could even go to a social monitoring dashboard and we can look at things like social mentions, we can look at social mentions via location or social engagement on Twitter, Facebook, and we can share this as well in both those same ways that I talked about previously. So there are so many ways to customize this to fit the needs of the customer. We want to make sure that they gain the insights they need not just through traditional media but also social as well. Jay Baer: Because it's got so many different pieces, it's got the influencer piece, you've got the media piece, and the insights piece, how do you charge for it? Do you buy each of these things separately or you can buy all of them? How does that work? Andrea Rosi: Yeah, so you can buy all of them together. We have plenty of customers that leverage the entire platform. If we have a new customer that they want to start small, they can buy different modules as well. So maybe they'll choose to start with just the monitoring and the analytics piece, that's a popular way to start, or we'll have people that want to start first with outreach and focus on the influencer and database side, so they can purchase that standalone as well. There's also options for add-ons too. So there is options for ... We have this Insights tab. If we click global insights, this is actually a managed service that we offer. This team offers human-based analysis and we'll build out really any type of analysis program that you need that aligns with your business objectives. Here, just as a heads up, this is Facebook and Twitter. This is looking more so at owned Twitter and owned Facebook, so this is an information that we're bringing in here but it's just a way for them to further integrate all of their efforts into a single location. And then one more thing I'd love to touch on is our Impact for Press Releases. And this is great. This is just actually new to the platform in mid July. So if we click on an impact report, this is where we go a step further than those traditional or as we label them standard metrics. So we are looking at not just reach but we're looking at the things like engagement, click throughs, downloads. We're using some of the same metrics that [inaudible 00:22:14] use to prove their business value. So that comms can be in the credibility that they deserve, in that same way. We're also able to take a deeper dive into the audiences that are reading a press release, so we can see their demographics, their age, their life stage in education. We can look at such granular data on the end audience reading a press release and we can further tailor our messaging moving forward towards those audiences. Jay Baer: Does that impact report work only for press releases that get sent out through PR Newswire, etc., or can you put that kind of analysis on any media coverage? Andrea Rosi: So that's a great question. What we are going to be launching hopefully by the end of this year, but I can't give you an exact date, is impact for earned media. And what that would be, envision in our coverage, for example, we are tracking all of this information across the web and Internet everywhere. Imagine if we could do that with audience demographics for any piece of coverage. So this would be coverage that's just out in the world and not related to your brand or a specific press release you're putting out, but the idea would be track all of the coverage that's in here now but also see the audiences that are consuming that coverage as well. Jay Baer: Right, because you might be covered in a particular place but maybe the folks reading that coverage are not necessarily your targeted audience, it's like, "Well, I don't really care." Andrea Rosi: Exactly, yep. So we're excited about that one. Andrea Rosi: For sure. So honestly, this is like a high level demo, what I just showed you. If there are certain areas you want to dive deeper into, we can. Jay Baer: Yeah, will you click back over to the impact, I want to ask more questions about that. Andrea Rosi: Yeah, for sure. Jay Baer: So the way it works now is I write a press release and we put some tracking technology I presume or something on there, and based on that when somebody reads it, when they open it, when they click on it, when they interact with it, when they play the audio clip you know who that person is and what their demographics are and some other details. Then we can use it to say, "Oh, we're actually moving the needle here. Jay Baer: That is pretty great. Now, when you send a press release today do you get this impact tracking or do you sort of say, "All right, the press release costs X and if you want to use the impact thing that's X plus Y." Andrea Rosi: So actually Jay I think we're giving it out for free right now but it will be an add-on price. I don't feel confident enough to tell you. Jay Baer: Yeah, okay. Though you could send a press release without impact but otherwise you're not really going to have much information other than what we've always had for press release data, which is we had this many people open it or maybe this many clicks. Andrea Rosi: Exactly. So the whole idea with impact is that we're taking things a step further and we want to make sure that we're not just relying on these metrics that PR has historically relied on but we want to be relying on metrics that help prove the actual value and the impact on overall business. So the same way that [inaudible 00:25:33] would measure their success, we want to be able to keep up with that and have really the same exact reporting structure to gain credibility. Jay Baer: It's pretty exciting. I mean for so long marketing, social, content, email, web, all those folks have had frankly better data than communications professionals have had, so if using Cision Comms Cloud can sort of be at par on the data side, that's pretty awesome. Andrea Rosi: Exactly, yep. That is the goal. Jay Baer: Fantastic, that is exciting. When you have the influencers, and we're talking about both traditional influencers, reporters, and social influencers, you can just kind of create a list of those folks, right? And then say, "All right, what are the people in this list talking about lately?" Andrea Rosi: Are you referring to when we're actually searching for influencers? Jay Baer: Yeah, so we've got a list of people who are baseball writers we looked at before. We can say, "All right, we want to really pay attention to these seven people, let's kind of monitor what they're writing about, what they're talking about on Twitter and kind of pay attention to that subset of the list." Yeah? Andrea Rosi: You could do that. I think that what's helpful though too is that when we do an influencer search we'll get realtime results and I think those influencers constantly change. So maybe someone, that someone we think we should monitor, there could be a new influencer out there tomorrow that's even more. Jay Baer: Yeah, that's a good point, absolutely. Would you recommend reaching out to influencers on Twitter through your campaigns tool or, because this isn't really a social media management tool, sort of using something else to kind of take that piece? Andrea Rosi: There is the option, but I would say because we're not meant to be a social media management tool it might be something, at least if you want to take it a step beyond just outreach, that maybe you decide to export those influencers and manage relationships in a different platform. But in terms of outreach, that's something that you could leverage the platform for. Jay Baer: Absolutely, I love it. Now that you have all this new stuff in the Cision Comms Cloud and all these fancy, shiny toys and you've got impact and we've got all the new databases and all the new coverage, are you seeing a different type of customer sign up for Cision Comms Cloud that maybe wouldn't have been a traditional customer? Andrea Rosi: That's a good question. I think we are moving more towards global brands. We still sell to agencies quite a bit, but we are seeing that more brands are buying more than agencies. I think really our tool is just helping them to consolidate their tools whereas before maybe they used a social media management tool to find social influencers, for example, and now they can do that in here. So I think ... Sorry, I got kind of lost for that one. Jay Baer: Let me ask it again. So now that you have all these new pieces it really is a communications cloud - you've got the ability to measure data and you've got the traditional influencer database, you've got the social influencer database and the campaigns piece and the news coverage - are you seeing a different type of customer or really a different use case for the tool? Andrea Rosi: So I would say that now that it's more integrated we are really just being able to offer customers a central platform to do more of what they used to do in multiple tools. So I just think it's a more complete and more integrated platform. And we also are, through product enhancements, able to better support global organizations as well. So we've added features around filtering coverage and influencers by location, not just focused broadly, so I think especially those enterprise organizations that have offices in various regions, they are better able to leverage the tool as well. Jay Baer: You said an interesting thing there, being able to use one tool. Because realistically, if you look at the top of your navigation here where your cursor is placed, you've got influencers, campaigns, news, insights, distribute and impact, it wasn't that long ago that you would maybe have to have five or six different logins to do those six things, and that seems like a big hassle. Andrea Rosi: Yeah, and to be honest, it wasn’t. Andrea Rosi: Very expensive. And it wasn't even until June really that there was a tool out there for comms professionals to even search for social influencers that weren't associated with a specific outlet. So I think just even recently we are seeing this consolidation happen. Jay Baer: Yeah, it's pretty exciting. And obviously as the head of product marketing you've got a lot of other things coming down the road that you can't tell us about today on Marketing Marvels. But I know that you've got all kinds of other surprises coming up towards the end of this year and next year as well, right? Right? Andrea Rosi: Yes, absolutely. So impact is definitely one of those areas that we talked about that we're going to be building beyond what is available today. And I will say, I can tease you a little bit with some more information, but one area that we are really passionate about as I already mentioned previously is this idea that we shouldn't just be targeting an influencer or a journalist based on whether or not we think they're relevant, we should really be focusing on our end target audiences and we should be going after those influencers that overlap with those audiences. So one area we are really pursuing is an influencer graph, and this would be a way to try to gather the influencers that are out there, the content that they are producing, and the end audiences that are reading that. So we really visualize this as we have our target audience and we can see all of the specific attributes that make up that target audience. And then, ideally, we using Pixel tracking technology would be able to see the earned media that that audience consumes and then be able to recommend influencers that would be a good fit for a brand. So that's where we're headed. Jay Baer: Because right now it's based on assumptions, right? You say, "Well, I presume this person is influential because of their subject matter and/or because of the site or the outlet that they create content for." But that may not be the case necessarily and so you say, "All right, let's start with audience. We want to reach moms who have two kids who are of this age in this part of the country who are interested in this topic. Who do they read, who do they listen to, who do they watch?" That becomes your target list instead of making it topics down. Andrea Rosi: Exactly. And as you saw, we do have some of those data points around audiences, but really being able to dig into the makeup of that audience and the specific influencers that will reach them, that's going to be so valuable. Jay Baer: It almost takes the whole historical way of doing it and just turns it upside down, right? So instead of saying, "Let's start with the newspaper and then go down," it's "Let's start from the customer and go up," and maybe it's a newspaper, maybe it's some guy. Andrea Rosi: Yep. And that's actually exactly how we talk about it, is flipping the model. And I think it's truly a must in the world that we're in today. So I'm excited to see how all this goes. Jay Baer: Yeah, it's pretty great. Thank you so much for the time and thank you for all the work that you have done on the Cision Comms Cloud. It's incredible, the single login is truly remarkable. But a couple of more questions for you, Andrea. So the first one would be how did you get here? You've been in the software business, you're a smart person. So why and how are you at Cision? Jay Baer: Or had a million logins. Andrea Rosi: Yeah, millions of logins and it was all about consolidating all of those tools into one. And truly this is the era of doing that for the comms and PR professional. So it felt like this is like the new and exciting place to be. Jay Baer: It's good for you, it's like you have seen this movie before. That's fantastic. Andrea Rosi: Yeah, exactly. So I'm excited. It's definitely relevant to my background, but it's a more new industry for me to focus on. Jay Baer: Last question from me. Other than Cision, obviously, what is a marketing marvel to you? What's a sort of martech software where you're like, "Man, I love this, I couldn't live without it." Andrea Rosi: Any software or related to PR and comms? Jay Baer: Anything you love. Andrea Rosi: I mean I was always a huge fan of Eloqua and the Oracle DMP and that whole story. And it's honestly really similar to what we talked about today really, look-alike modeling and going after audiences that are similar to the types of people you've had success in the past and gained interest from in the past. Jay Baer: Just in that case you'd do it via advertising and in this case you'd do it through coverage. Jay Baer: Yeah, it's pretty interesting. Yeah, same idea of kind of flipping the model upside down, Oracle Marketing Cloud technology. Thank you so much for being here, thanks again for everything you're doing at Cision. Folks, make sure you go to cision.com, sign up for a demo. You might even get Andrea herself if you ask nicely to do a full-blown demo for you or somebody on her team to kind of give you a little more drill down on each of these six tabs that you're looking at now and how you can be a modern communications professional by being very thoughtful about who you're reaching out to, what you're saying, using analytics more wisely, all that jazz. Don't forget, we've got new episodes of Marketing Marvels all the time where I bring you marketing technology that I think is pretty awesome and I think you will also. If you go to bit.ly/marketingmarvels - that's bit.ly/marketingmarvels all lower case - that will take you to the YouTube subscription page where you can subscribe to make sure you do not miss an episode. Marketing Marvels is a production of our team at Convince & Convert Media. Thanks so much for watching, I will see you next time.